Wingsinflight - Purple Martins and maintaining a Martin colony. I first put up a martin house in 1996. I did not have the knowledge then of how to attract them other than to keep the housing away from trees so I got a martin house and put it up and in May that year got a couple of pair. A few years later I educated myself some more on these birds and realized there was a lot of things I was doing wrong and that the type of housing I had was not the best! There was a lot more to being a Martin Landlord than just putting up a house. Things such as regular nest checks, Starling and Eurasian House Sparrow control, modifications to improve housing and many other things. Since then I've made numerous changes and describe further down under "My site History" what has changed over the years, along with some seasonal photos. After 16 years I no longer have the colony or housing, but still promote the proven methods benefiting Martins & of being a good landlord. So, on this page I won't be adding information as such on how to attract martins to a site, other than my own experiences, but recommend instead visiting the Purple Martin Conservation Association which is full of information on every aspect of keeping Purple Martins, as well as the many informative links below. Ask any purple martin questions here. Track Martin Spring Migration in the US. Very informative site by Chuck Abare. Growers of Gourds for Martin and birdhouses. Purple Martin Information, Gifts and Supplies. MartinFest 2004, June 18th & 19th. Join other Martin Landlords at the USA's largest colony. Using radar to track bird migration. 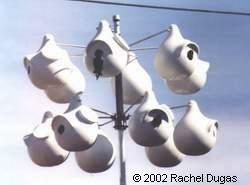 Purple Martin Landlords of North Texas - Roosts found in Texas and other locations. Roost sites can be submitted here. A map of the roost site and and excellent video of Martins coming in for the night. Promoting conservation of Chimney Swifts. Also report first spring sightings here. My Best Nest - A childrens picture book. Eurasian House Sparrow and Starling ID. 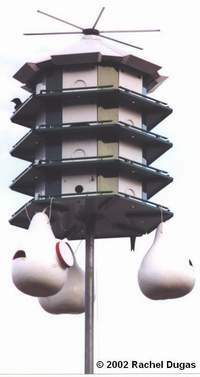 These birds must be controlled if you are to have any chance of a successful colony. They were introduced to this country many years ago, not realizing the devastating effects they would have on our Native birds. They are not protected legally and should either be trapped and/or shot so as not to interfere with Purple Martins. These birds are destructive to many cavity nesting, Native American bird species such as Woodpeckers and Flickers, Screech Owls, Bluebirds, Chickadees, etc., as they take over their nesting cavities or destroy their nests & eggs. They will even kill the adults themselves. Please be sure to ID these two birds correctly however as females of many species can look similar. Below are a couple of photos of the "males" of each species - a good field guide is recommended so as not to confuse them, the females especially, with other similar native birds such as the House Finch. All Native Birds are protected by law. HY - Hatchling Year, the birds very first year. SY - Second Year bird, the birds first breeding season. Partial colors developed. ASY - After Second Year, or adult, the birds third year with full color developed. The first house I had was made of Aluminum. The roof was removable, leaving the top level with its 6 6x6 compartments accessible all at once from the top. This top level then detached leaving the 6 6x6 compartments on the bottom level open for clean-outs. 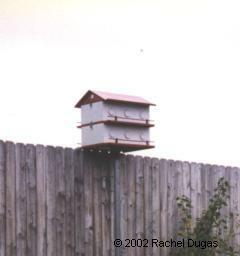 These houses do attract Purple Martins but are not the best for maintenance reasons. Having the floors remove the way they did exposes all compartments at once which is not good when doing nest checks as it will disturb many martins and young at the same time with possible hatchlings jumping from one compartment to another. Instead, housing with individual doors that open from the front is recommended. Also the floors of this house were bare metal, with no sub-flooring to keep the nests dry. However they seemed to build a good nest base out of mostly mud and leaves. Then the roof was red in color. This would get very hot and it is much better to have a white or light colored roof to help keep the housing cooler. Another bad thing about this set up was that I had it on a two part telescoping pole which was very hard to raise and lower, and at that time I was not aware of the need for nest checks and Sparrow nest removal so it was only lowered at the end of the season. Telescoping poles are definately recommended to make nest checks easier. I had the house this way for seasons 1996 - 2000. Out of the 12 compartments I only ever had a total of 4 pair. Below is some basic data I kept for this house. By the end of 1999 I had read a lot of information regarding martins and figured it was time to introduce some changes. I realized that to be able to do maintenance checks I needed housing that was easy to raise and lower and that also had the recommended larger compartments. I had found the PMCA and by February of 2000 had a new Super Gourd setup with 12 plastic, round holed gourds and which raised and lowered with a rope and pulley. So much easier! I put this set up about 15 foot away from the Aluminum house, which I planned to keep up for another year while the martins got used to the gourds, and hoped that some would even make the switch. I did remove the dividers in the metal house to make the compartments larger but it took only a day or so for the starlings to see this and they were going in and out frequently. As I could not maintain this house by lowering and was not able to provide SREH for this house I changed the compartments back to the smaller 6x6. I still had 3 pair nest in the house and it seemed that one of the pair moved over to the gourds and several others showed interest as seen in the photo above. They were ASY's. I did the recommended nest checks on the one occupied gourd that season and had 5 babies fledge. Originally there were 7 eggs, 2 were tossed out presumably by sparrows. I also trapped the sparrows in the gourds during this season. This year I decided to remove the old Aluminum housing as I had left it up the previous year with the introduction of the super gourd rack. This year I just wanted to go with the gourds and figured that as I had a pair nest successfully in one of the gourds last year this may be OK.
Well, the pair that nested in the gourds last year were the first to return however they met another challenge. I had converted over to all SREH crescents. They tried numerous times to enter the same gourd without success. A day or so later the others showed up and constantly waited on the wires for me to put up the old metal housing. They would fly around the old pole that was still standing next to the fence knowing that it was there last year. It was heartbreaking to watch, and even worse to see that the other pair could not enter their old gourd with the new crescent hole. I had put calking underneath the entry hole inside and out to help with grip but no luck. The other martin pairs showed no interest in the gourds and I subsequently lost all 4 pair. With the others gone, the pair from the gourds moved on too. I thought I had done everything right but I guess we learn by our mistakes. I put this down not just to the switch in entry hole to SREH but maybe also due to the fact that even though the gourds were up for 1 whole year prior to removing the Aluminum housing it just was not long enough for them to make the adjustment. (Lesson - leave old housing up for at least two years!). I think had I been able to provide a better type of aluminum house along with the gourd rack, something of similar style with what I had before, but one which I could maintain easier, then they would have had a choice & maybe I would not have lost my colony. However finances at the time did not allow for this. I'm sure they may have gotten used to the gourds and the SREH over time. First seen - Feb 19th (2 martins). This is the earliest seen. They've been arriving earlier each year. In 2002 I was on a mission to get my martins back! I got rid of the super gourds and went back to more traditional housing that was along the lines of what I had back in the '90s. This time I put up a Hexagonal Trio Castle, with a winch and pulley. Underneath it I hung 3 Natural gourds with Crescent SREH. The reason I used the naturals is because of the great reputation they have for ease of entry and for supposedly being a magnet for martins, due to their natural rough texture, dark insides and again large size (one is 9" and the other two 10"). I prepared them with Copper sulfate, 3 layers of primer and 3 layers of outdoor latex paint. The Trio Castle itself was modified inside, making 2 side by side compartments into one with a 2" hole through the dividing wall. This results in 12 compartments instead of 24. There are 4 levels, each one having 3 compartments. I had both crescent & excluder SREH on 9 compartments. On 3 compartments I blocked off the inner connecting doors making them into the original smaller compartments and put on the traditional round holed entry doors. I did this to provide any investigating martins with a choice. I also have a "Spar-a-door" trap on permanently as seen in the photo. Also when starting out I used a decoy to help attract martins to the site. Its "tail" can be seen in the photo left! The Martin on the top is a real one. I also put down non slip bath tub tape on the floors on the inside entry room (which has no subfloor) as the metal floors can be slick, as well as a strip on the outside under the entry hole to aid in grip. Inside the "Nesting Chamber" I've put down the metal subfloors and then on top of those placed a 1/4 inch piece of plywood cut to the same dimensions. This gives the room a more natural feel under their feet in hopes of making the housing more appealing to investigating martins. It also helps prevent any possibility of leg splay in young birds. Well, I had one ASY pair return for this season and they chose a compartment on the top level which had round holes and was left at the original 6x6 size. They did not want to move to a larger double compartment with the crescent openings and they did not allow other martins to land on the housing either until late in the season. The following year I put on porch dividers to help prevent this. I did have 2 other SY pairs that stayed around the site but did not nest. The females were a little spooked by the SREH and refused to go in, but stuck their bodies in half way for a good look! I did see of the SY female go into a crescent entry completely and came out just fine, but she did not stay. It all takes time! First ASY seen - Feb 20th, Male & Female flyover. Total Eggs in House - 5 eggs. First Fledge date - Expected - June 9th/10th. ~ 3 fledged on June 11th! Total Pairs - 1 pair. Trio Castle, 100% SREH + 3 Natural Gourds with Crescent Entry. One Sparrow Trap door & one large gourd trap for Starlings. Porch dividers (not show in above photo). Total Compartments - 11 enlarged 6x12 in house, 3 Natural Gourds. Nest checks are done every 4 days throughout the nesting season, after 11am, so as not to disturb the nesting females which lay a single egg each morning. For the past several years our Martin house was gettting fewer & fewer visitors. Our garden was planted with shade trees several years ago and as they got larger the site was becoming less attractive to Martins, but 3 sides still remained open. Each year I continued to put up the house and still had a pair of ASY Martins showing interest as did the SY's when they arrived. But I continued to put up the house for any Martins that wished to nest here until the day came when the site is no longer productive or appealing to them. However, over the past few years (2005 onwards) things have changed with the colony and activity is picking up once more. Below is a year by year summary of the site! First hatch date - X. Eggs were abandoned. First ASY seen 2004 - Feb 27th. First egg laid - Sometime between 15th & 28th? This was a strange year because although the inexperienced SY's were unable to hatch their eggs, this ONE PAIR had TWO nests, 4 eggs in one compartment and 1 egg in another! It was also the FIRST year that the birds had entered and nested in cresent entry holes (SREH)! First ASY seen (in area) 2005 - Feb 26th. First hatch date - June 8th approx. First egg laid - April 22nd. This year was a surprise! I believe I got many birds from a colony not to far away because they didn't raise their house early enough. When they finally did they only had a couple of pair when normally its a full house. Either way I was very happy to see this many birds at my site! First ASY seen (in area & at my house) 2007 - Feb 24th. For the 2007 season the site has been improved somewhat: We have had a pool put in close to the martin house and because of this we have removed a large limb off our tree which would have overhung the pool & was also the branch that grew too close to the martin housing. This has improved the flyway on that side of the housing a lot. Also, the housing has been moved a little further away from the tree so the situation has been improved all around! 1/28/07 - Martin house is now in the ground in its new position. It has not been raised yet and will have some newly painted porch dividers added before it does. A week later: New porch dividers have been added. (Previously I had aluminum ones but, although glued on they kept falling off with high winds, so switched to wood.) These new ones were cut from lumber 41/2" x 6" x 1" dressed to 3/4" thick. They were painted white & this made them fit snug in between the rails on the house with no glue added (although glue or caulking could be used to secure if necessary). Modification directions above. Estimated first scout arrival - Feb 26th. 2/15/07 - Very cold temps reaching down to 20 has, unfortunately, killed many martins that have returned early. It is heartbreaking to have a martin return to your colony and then die to to extremely cold temperatures and consequently the lack of flying insects. Many people will supplement their martins with live crickets and mealworms but sometimes the extreme cold is just too much. I am still awaiting the return of my martins but hope they do not come anytime soon because there is always the chance of another bout of very cold temps. 5/7/07 - Egg laying is well underway, with 8 nesting pairs and so far 29 eggs. Number of eggs still going up daily. Two nests are up to 6 eggs. 2/23/08 - Well my first pair have arrived right on schedule, a day early infact. I saw the male first and then lowered the house and as soon as I had opened up the house and raised it back up, along came the female and they both flew to compartment #9. This year I have removed the 3 natural gourds that I had. They were no longer in good shape and had never been able to attract a nesting martin, as they always prefered the house. This year I may try 3 super gourds underneath instead. 6/3/08 Update - Well, this is definately a disapointing year. The begining of the season looked promising with what looked like at least 7 pair having returned. Nests were made and a couple of pair began laying eggs. Two pair each had 5 eggs each.... but then came the starlings. Up till this year I've never had a starling problem, only house sparrows, which I dealt with accordingly. However, this year a pair of starlings were able to get into the cresent SREH, which are on 100% of my house. Not just one, but possibly 3 of them. One morning I came out to hear a terrible screaching. I immediately lowered the house and opened the noisy cavity. There was a starling on top of a Martin. I was furious. I was able to pick up both birds separately. I looked at the martin in my left hand - he looked OK, no bodily damage, and I let him go. The starling wasn't going anywhere and I dealt with him. The Martins returned but over a week or so many of the pairs disapeared. Then one morning I found no eggs at all in the one cavity and only 2 eggs in the other. Starlings had returned, this time a new mate. I do not know if they removed the eggs or whether they were discarded by the martins, but the starlings were now entering the cavities where the martins were trying to hang on. On the cavity which had 2 remaining eggs I decided to change the door to an excluder entry hole (bat shaped hole). This would not allow the starling to enter, however skinny it was. I had decided not to add them to the house previously because the martins never entered them at all, but that may change now. I hoped that as the martins still had 2 eggs remaining that they would be determined to get into this new shaped entry hole. And they did, with no problem after a couple of tries. I now felt a lot better that at least the eggs would remain safe. I am unable to shoot starlings in our neighbourhood and as I am not a shooter, probably still wouldn't if I was allowed. Over the next few weeks I kept watch on the house and the starlings now gave up and moved on. Strangely enough, while the starlings were there I had NO house sparrows attempting to nest! ??? But now they've returned as the starlings have left. I can deal with those though. One martin pair now has 2 young. The other pair has a new clutch of 4 eggs and now a third pair have 5 eggs. Hopefully they will get through this year now without any futher problems. Once the eggs have hatched I think I will also switch the doors on the remaining two cavities to protect them also. July 30th Update - Well, in the end I had 3 pairs which nested. The one cavity with the remaining two hatchlings on which I put the exluder door went on to fledge without any further problems. The other two cavities which had 5 eggs and 4 eggs both fledged 4 young each, the one egg having been discarded. No starlings returned. 2009 - Change: 50% Excluder entrances, 50% Cresent. First egg laid - Unable to check. Final note - After switching the house to 50% excluders the Martins no longer have a problem entering these entry holes as they did when I first tried in earlier years, so I will be switching to 100% Excluder for next year. All the excluders this year were on the top two rows of the house, where the majority of the martins nested first, just a few being in the lower cresents, so I feel confident that this should not cause any problems next year and will only increase the chances of their protection from the occasional starling which has shown it is able to get into the cresents. July 18th - This was a cruel year for the martins regarding heat. I had one more pair this year compared to last year. 44 eggs were laid but unfortunately two compartments had eggs that were probably infertile and did not hatch, 5 in one, 7 in the other and were the nests of SY birds. Of the 31 eggs that did hatch I had 3 certain deaths due to the extreme heat. The birds were jumping out several days before they were ready to fledge. In most cases I was able to round them up and put them back into their compartments. However, after doing this every day and replacing them into their cavities, two died inside the house and one was found in our pool skimmer. :-( This is the one and only death we've had of a martin in our pool. So three certain deaths. Two others flew out but landed in neighbours yards not to be found again. Who knows if they survived or not? Still, taking into consideration the extreme heat the numbers for this year still good in comparison to my other years, It was still my second best year I've had so far regarding fledgling numbers. March 17th - Martins were very late showing up this year and only two males at that. Even now I've only seen these two with no others around. Not the best start to the season. The past week had a lot of rain and cold temps in the 40's. Today its nice and warm with highs in the 80's so hopefully some more martins, females especially, will come to the area. March 27th - The past week has seen and increase in martins at my site, finally including one or two females. Most are males and all seem to be happy to be home! I think the cold weather that showed up a few weeks back stalled many of the martins, keeping them to the South of us. 2010 - Change: 100% Excluder entrances + 3x Exluder Gourds beneath. First ASY seen (in area & at my house) 2010 - March 10th. June 1st - Where are all the SY's??? I haven't seen any this year? Very strange... Fewer nesting pairs this year also, only 5 compared to last years 9. 2011 - 100% Excluder entrances + 3x Exluder Gourds beneath. First SY Male - May? Date unknown. Nesting - End of April aprox. Extreme Heat killed several young birds this year. 2012 - 100% Excluder entrances + 3x Exluder Gourds beneath. First SY Male - ?